“Go and do likewise.” The story of the Good Samaritan is the foundation of what Samaritan’s Purse lives and breathes. Through the assistance of volunteers in Baton Rouge and around the world, they are able to rebuild homes and lives. Our team of 5, arriving from 4 different Innovairre offices, arrived in Baton Rouge as strangers and left as friends. Our trip was not only about repairing homes but in the relationships forged and the people we were helping. We arrived in anticipation of helping someone we may never meet. The site I was assigned to was a new home construction. Darlene, our homeowner’s daughter, came to work alongside us mid-week, and share her mother’s story. The homeowner, Ms. Martin, is an 80 year old woman who still works full-time for the Sheriff’s office, lost her home in the flood of 2016; her home was condemned after sustaining seven feet of water. The family living on the property woke her up in the middle of the night to four feet of water and had to evacuate in the dark. 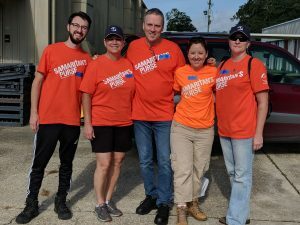 Darlene spoke over and over again about how grateful she is to Samaritan’s Purse and the countless volunteers arriving week after week to help rebuild her mother’s home. During our week, each day we marveled at the progress from morning till night of our crew of 6. We were especially excited for the homeowner (living in a FEMA trailer next to her new home), when we finished installing the doors and windows. The house was looking more like a home. Throughout the week, we learned new skills and tested some of our limits (especially of heights), but we knew it was for the greater good. When a home is finished, each homeowner is presented with a Bible and a journal which contains messages from each volunteer who worked on the house. We look forward to that moment when Ms. Martin finally moves into her new home.